Rediff.com » Movies » Can these serious directors make you LOL? As a director, it's easy to get complacent and get used to certain genre. Nothing succeeds like success, which is why directors become known for a certain kind of cinema. However, the best directors always try to escape their comfort zones, to see how versatile they truly are. And what's more versatile than a serious filmmaker, one known for dark films with brooding subjects, moving into comedy mode? One of his own films, Fashion, had people describe Bhandarkar as a realistic filmmaker who makes films on social issues. With films like Page 3, Fashion, Jail and Chandni Bar, it's clear that Bhandarkar likes to keep it realistic, at least in terms of subject. Now, with Dil Toh Bachcha Hai Ji, he's taking on a comedy about three immature adults. Let's wait and see what happens. India's most critically appreciated filmmaker, Bhardwaj has always showcased humour and wit in his films, no matter how dark or brooding the subject. After films like Makdee, Maqbool, Blue Umbrella and Omkara, Bhardwaj's manic Kaminey was a crazy comedy that upturned the Bollywood formula film on its head. His next, 7 Khoon Maaf, looks to have some madness in it as well. Now this is a man who can truly manage both intensely emotional as well as insanely funny cinema. Starting out with Ghayal and Damini, hard-hitting melodramas both, his third film was the cult comedy Andaz Apna Apna, featuring Salman and Aamir Khan. Recently, after films like Khakee and Halla Bol, Santoshi returned to comedy with the successful Ranbir Kapoor starrer, Ajab Prem Ki Ghazab Kahani. The master filmmaker was a genius at recognising the basic human condition. Active since the 50s with films like Musafir and Anari, he went on to Asli-Naqli, Anupama and Satyakam in the 60s, and with 1970s Anand, established himself as a master of emotional drama. And then, after back to back Amitabh tearjerkers Abhimaan and Namak Haraam, he made laugh riots Chupke Chupke, Mili and Gol Maal. What stunning versatility. 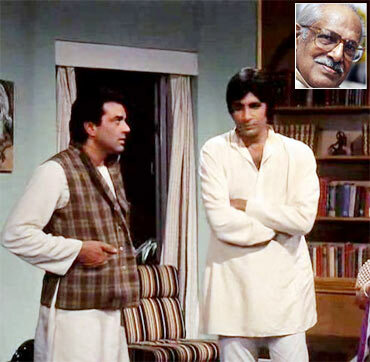 One of our cinema's most romantic writers, Gulzar's cinema drew applause for its evocative portrayal of relationships. Of relationships fresh and stale, optimistic and astray, challenged and torn asunder. 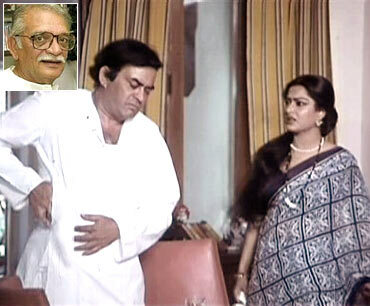 It was, then, a complete surprise when the man behind Mere Apne, Parichay and Khusbhoo made the amazingly funny Angoor. An adaptation of Shakespeare's A Comedy Of Errors, the Deven Varma-Sanjeev Kumar starrer still remains a fan favourite.